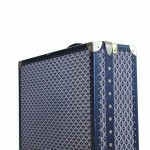 Luggage has developed beyond the days of huge wooden trunks strapped to the back of horse-drawn carriages, carrying everything you would need for a trip beyond your front door. 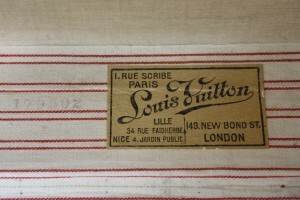 You may not know it, but we owe a lot of this innovation in part to the one, the only, Louis Vuitton. Today, we take some things for granted. Locks that can’t be broken or picked easily. Goods made of fabrics impervious to water. Stackable boxes. In the mid-1800s, though, those things were not commonplace—or even in existence at all. 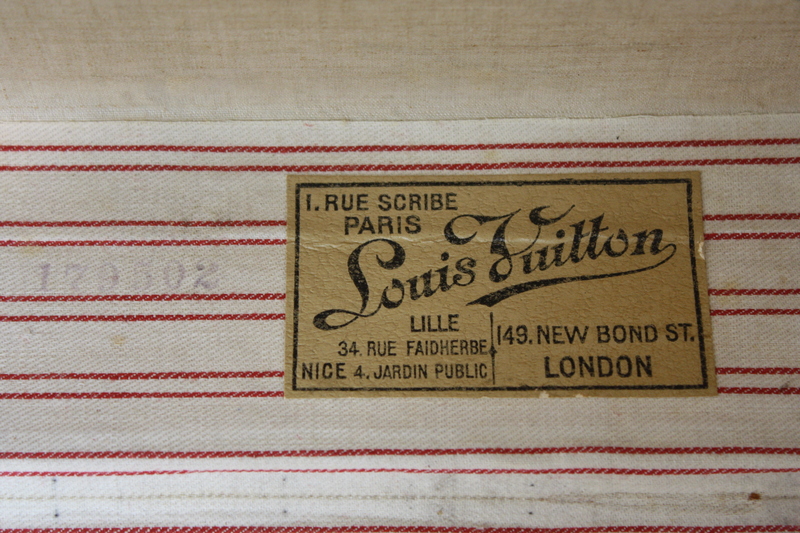 It wasn’t until Louis Vuitton actually designed a rectangular trunk made of canvas (making it lighter, and more water repellent) in 1858 that people realized how much sense it made. 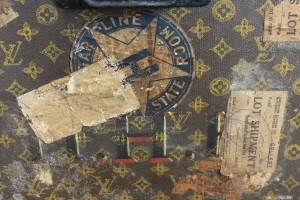 Gone were the domed trunks that made stacking impossible. In 1886 Louis and his son Georges took traveling without worry one step further—they invented a single lock system with two spring buckles, which made a lock that was deemed unpickable. Georges even challenged Harry Houdini to make an escape from a locked Vuitton box through a public newspaper. Okay, Houdini didn’t respond, but we’d like to think it was because he found the challenge too overwhelming. 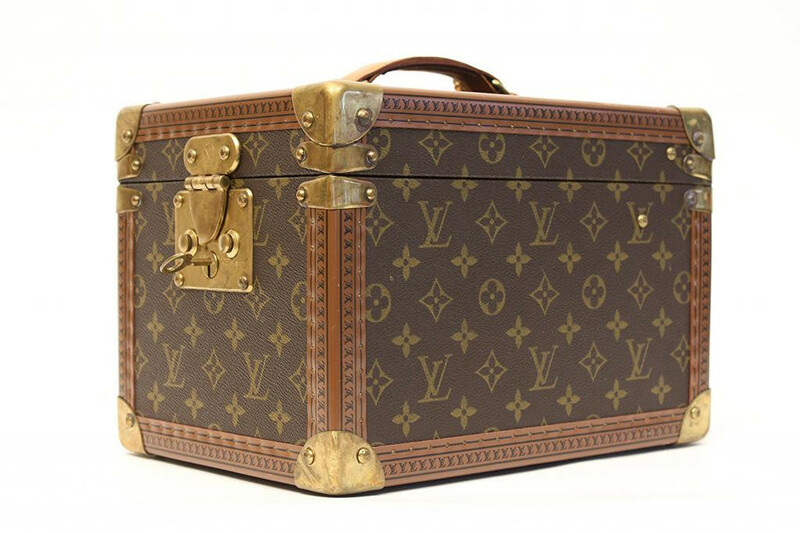 There is something very romantic and intriguing about a Vintage Louis Vuitton trunk— intercrossing L’s and V’s, built-in clothes hangers, interior compartments with quilted linings, travel stamps from its journey around the world, the famous unpick able lock. Want! Need! The Vintage Louis Vuitton Trunk is not just for travel anymore either. 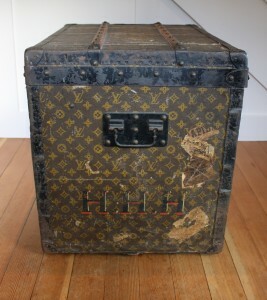 I have lots of chic clients who use their LV trunks for coffee tables or take a cute Vintage Louis Vuitton Boîte Falcons Train Case and use it as a jewelry box in their bedroom! 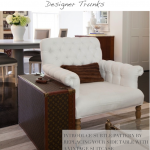 Luggage aside, Louis Vuitton is among one of the most immediately recognizable fashion brands in the world, with its trademark interlocking initials, quatrefoil designs and signature beige on brown coloring. The fashion house now sells all sorts of goods, from its popular handbags and wallets to belts, accessories, and clothing. 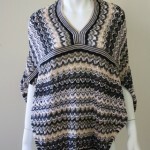 Have you checked out the latest fall/winter ready to wear collection? 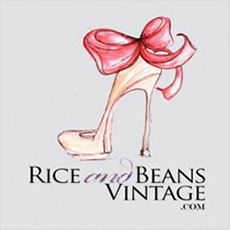 We love the mixed materials, flattering silhouettes and classic handbags. 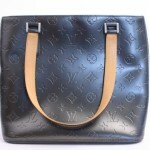 Shop Vintage Louis Vuitton Now!